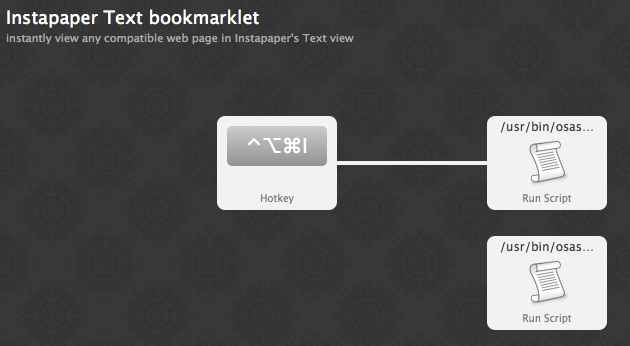 Here is a workflow I use to instantly view any compatible web page in Instapaper's Text view, without adding it to your Instapaper account. In the workflow, there is two scripts. The upper one (currently connected) is for Chrome. The one on the bottom is for Safari. I decoded the html with an online app, then replaced spaces with "+" in the places I thought were required. I'm unfamiliar with this stuff, though. Any ideas on making this work? And here is the updated workflow. Ah, thanks! Once I changed your Instapaper user id to mine, worked great. It was just a matter of a couple mixed up plus signs and spaces. Here it is; sorry for the delay! I'm unable to make this work in Brave – would there be a quick fix for adjusting the Chrome code? Thanks!